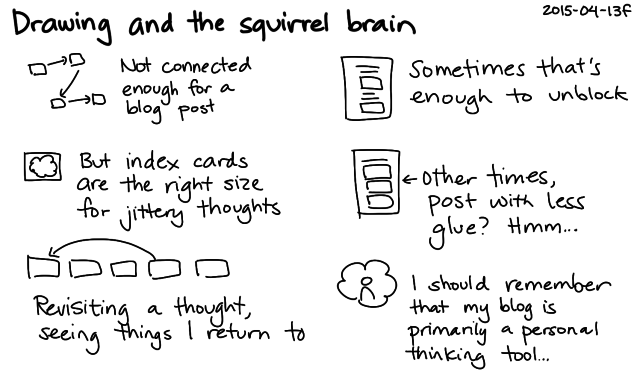 I’m dealing with squirrel brain at the moment. 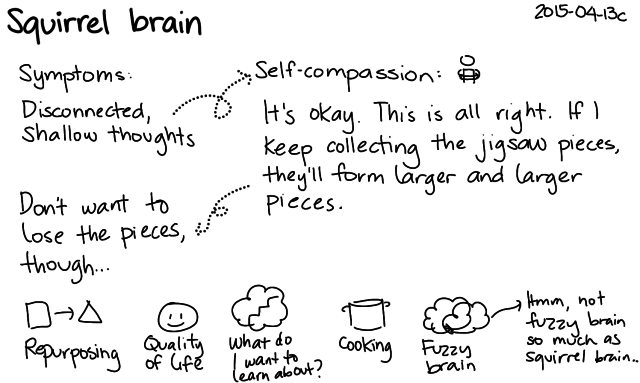 It’s different from fuzzy brain in that squirrel brain feels like I have lots of thoughts that don’t yield much depth or connection, while fuzzy brain is like finding it difficult to think or concentrate in the first place. Anyway, since I’m probably not the only one who’s dealt with squirrel brain and I will most likely run into it again in the future, here are some notes. The self-compassionate approach of accepting it is what it is seems to work out better than trying to push myself to come up with something deep and insightful. 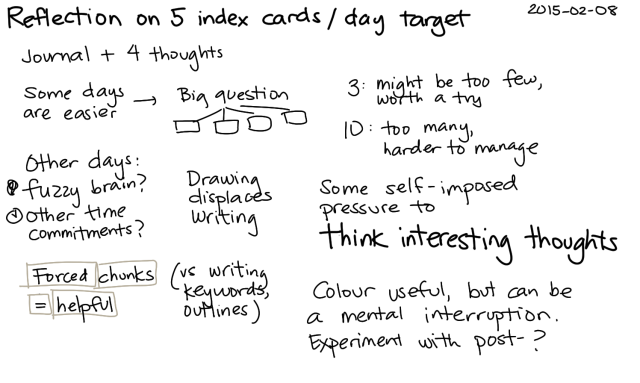 Come to think of it, my favourite writing times are when I’ve been noodling my way around a topic for a while (through sketches and other blog posts), so when I write, I can see the connections, and I can share results from little experiments. So this here – this squirrel brain – might just be because I’m wrapping up some things that have occupied my brain for a while. (Maybe I should do more of the mental equivalent of succession planting…) Anyway, if I keep finding, collecting, and organizing the jigsaw pieces of my thoughts – or, to return to the previous metaphor, planting lots of seeds – it will probably come together later on. 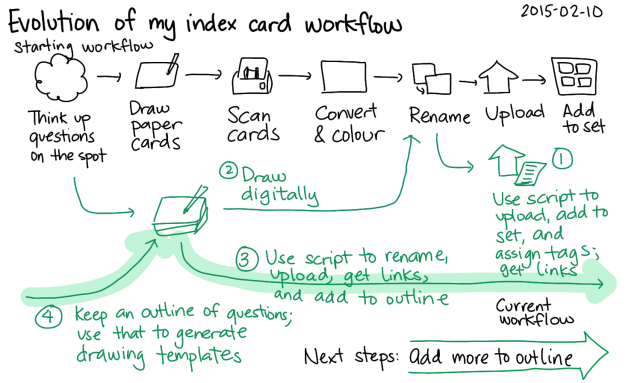 Index cards work well for those. 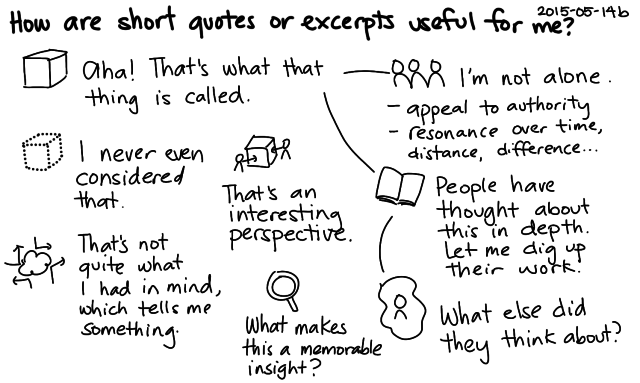 They’re small chunks, so I don’t feel like I need to think big or deep thoughts. 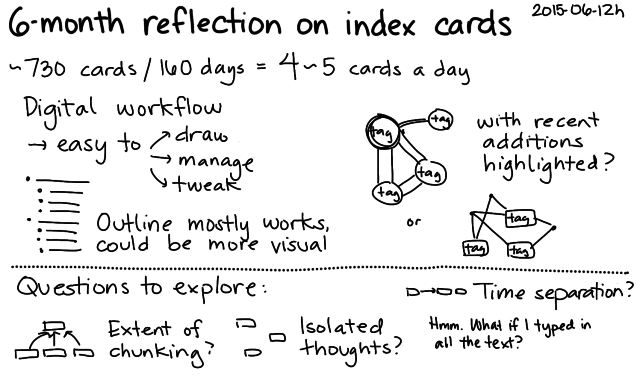 If I make myself draw five or more index cards, I tend to find myself revisiting some thoughts, which is good. The first shallow pass clears my mind and gets things out there. Then I can see what I’ve been thinking and develop it in a second or third or fourth pass. 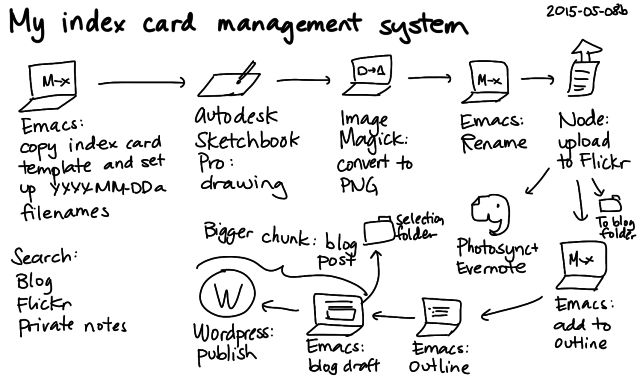 Working digitally is great. I don’t even have to worry about wasting paper or keeping things organized for scanning. From time to time, I might post more thinking-out-loud things like this. Not quite stream of consciousness… I tried dictating to my computer earlier, while I was pinning up the bias binding for my gingham top, and I think dictation makes me feel even more fragmented. 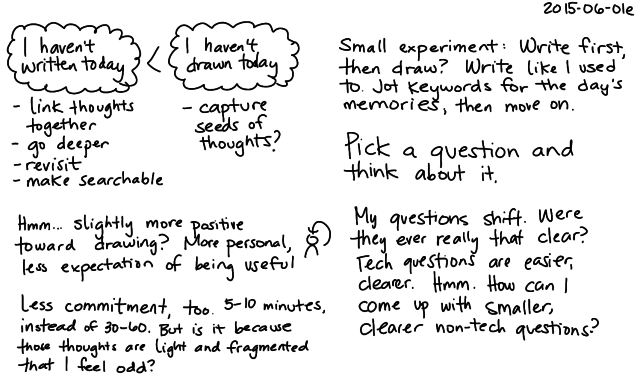 Anyway, this sort of semi-stream-of-consciousness writing – launching off some drawings, trying to quickly capture an idea – that might be a way for me to work around squirrel brain. The important thing is to plant those seeds, keep collecting those jigsaw pieces, keep writing and drawing. If I forget or I let things blur together, I won’t get to those moments when things click. 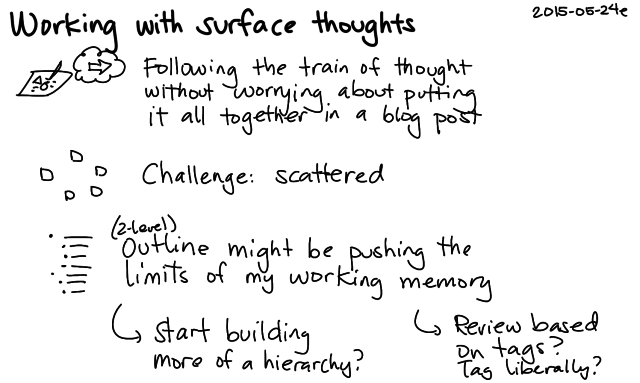 I’m working on writing more posts that people might find useful instead of filling every week with my ruminations. One of my challenges is that posts make sense to me (of course), but I’m sure there are many people for whom the posts don’t make sense. Sometimes there are unanswered questions, or extraneous material that I could move to a separate post. Maybe the flow doesn’t make sense to other people. How can I learn how to step outside myself and read my writing with a stranger’s eyes? One way is to ask for help: if you can share your thoughts (both content and style) on my posts through comments or e-mail, that would be great. (Consider it an open invitation!) Another way is to pay for help, especially if I can be clear about the kind of feedback I want. (More logic than typos, please!) 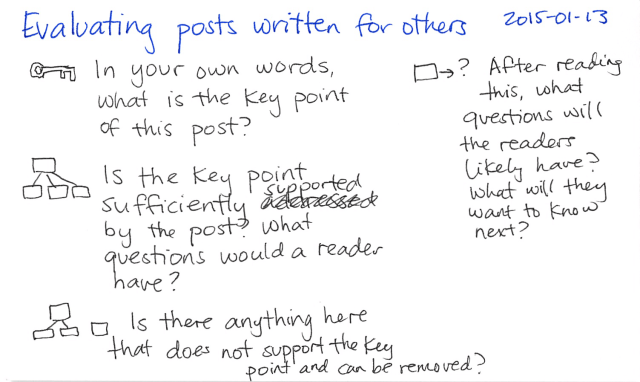 A third way is to develop a list of questions that I can use to evaluate my own work. Does the post title start with a verb? Can you think of a more vivid verb to start it with? Does the post title help people decide whether this post is relevant to them? Is the first paragraph focused on “you” (the reader)? Does the first paragraph or two help the reader quickly decide whether this post is relevant to them? Do I share my background (context, etc.) 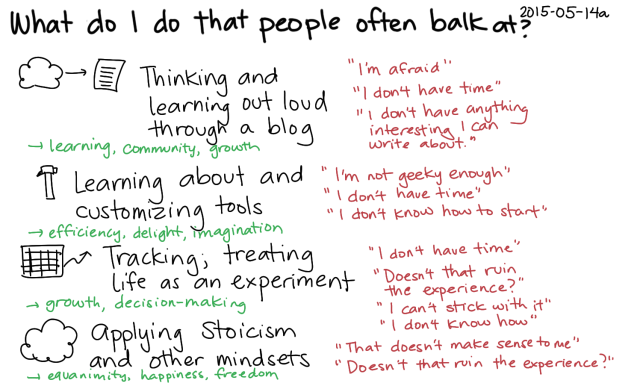 in a way that helps the reader understand what I’ve learned or how I can identify with them? 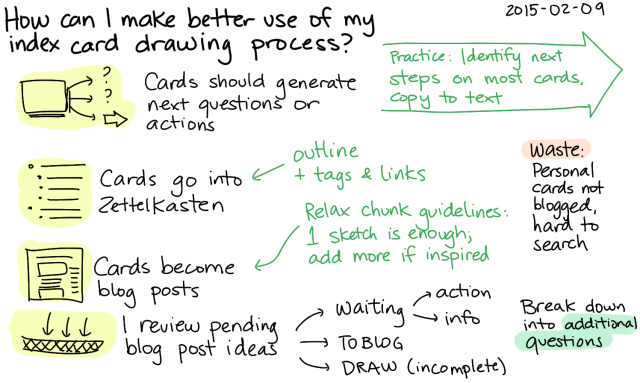 Do I share a useful tip that I have researched or personally experienced? Is the next step clear for the reader? In your own words, what is the key point of this post? Does each paragraph have a key point? Do the paragraphs flow logically? Does each sentence flow logically to the one following it? Is the key point sufficiently supported by the post? What’s missing? Is there anything here that does not support the key point and that can be removed? After reading this, what questions will the reader likely have? What will they want to know next? 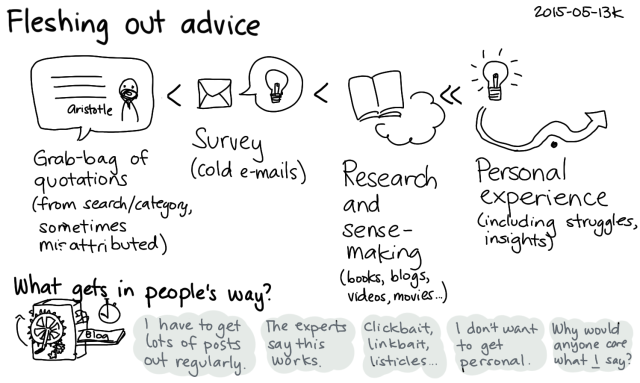 Do I include research or links to other sources (not my blog)? Are there related links, and do they look interesting or useful? What else would you suggest to improve this post? This particular post does not count as an other-directed post. It’s me trying to figure things out. 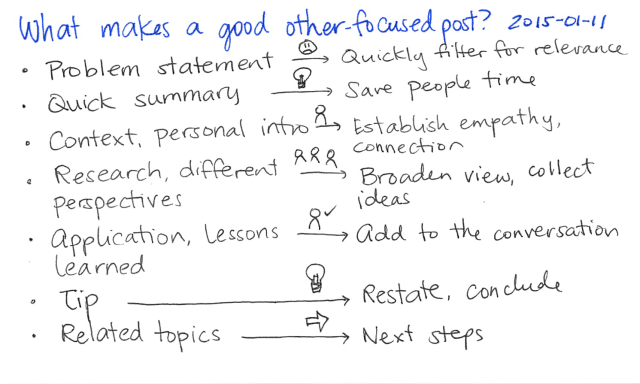 =) The other-directed version of this might be called something like “Use checklists to get better at writing posts that other people will find useful” or “Pay for perspective by hiring editors for your blog”. My other-directed posts start with a verb, and I usually schedule them for Thursdays. 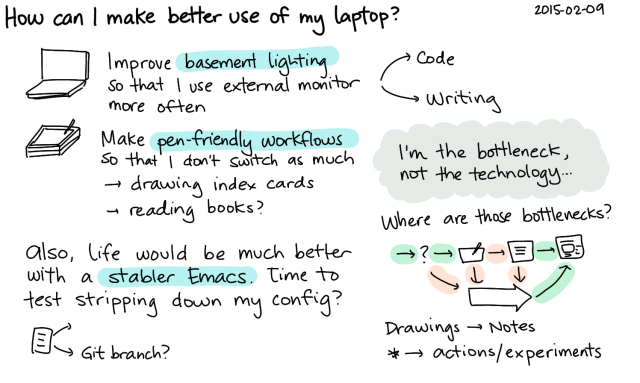 But if you’ve got some ideas on how I can write better, I’d love to hear your suggestions in the comments. Thanks!